Please find below a special message from our friends at Newsmax Finance. They have important information to share with you. New Trump Alert: Cut Your Taxes to ZERO! This new loophole will save taxpayers who use it billions in taxes — and slash their personal taxes by 20 percent! This loophole can be used by anyone if they follow several simple steps revealed in the new book The Trump Tax Cut. Even the highest-income earners can see their tax rate drop to a shockingly low 29 percent! And there are hundreds more deductions and loopholes in the Trump tax law… so many you can slash your taxes to ZERO! It is really possible! So says renowned tax expert Eva Rosenberg, who shows you how to benefit in her new bestseller The Trump Tax Cut. #1 Big Loophole You Must Know! Here’s the deal: Trump slashed corporate rates to 21 percent, but personal income taxes not so much — to 35 percent for the highest income level. But Trump gave you a secret “trapdoor” for lower taxes. If you’re an independent contractor or small-business owner (many employed people can change their status! ), there is a special deduction of 20 percent of your income that makes your effective rate just 29 percent! Already hundreds of thousands are taking advantage of this loophole. Anyone can grab it, but there are requirements and they may need to change their job status with their employer. The Trump Tax Cut book gives you the full info PLUS how you can legally make this change! Bottom line: What does that mean for you? You could easily be among the 80 percent who can lower their tax bill or will cash a huge refund check… only if you know how to take advantage of the sweeping reforms. 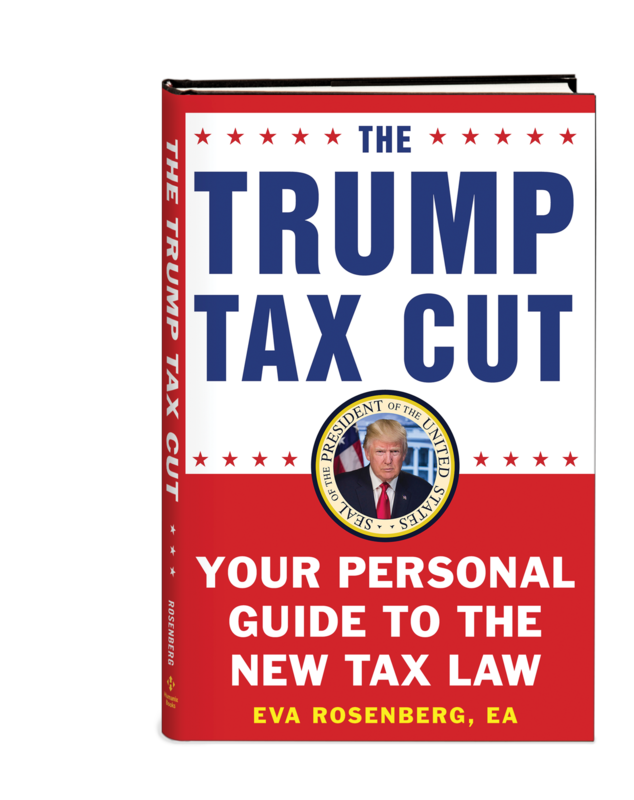 The Trump Tax Cut by Eva Rosenberg reveals the secrets to keeping more of your hard-earned money! This new book is packed with hundreds of write-offs, tax breaks, credits, legal loopholes, and NEW information that can literally save you a fortune — and it’s yours absolutely FREE with this special offer. Are you caring for a loved one? Maybe your parents still live on their own, but you’re stopping by a few times a day to help with medications or to bring them food. Or maybe you had your dad move in with you. The government will pay you to take care of any family members in need. And the income isn’t taxable. You pay zero taxes on the money you earn. TIP #96 is a true blessing. Thinking of refinancing? Beware: The new law only allows you to deduct the interest on the original loan balance. TIP #12 could save you from making an expensive mistake. The most overlooked tax deduction — I’ve met accountants who don’t know this. If you’ve got an RV, motorcycle, boat, or other “toy,” TIP #5 reveals the deduction you can take — right down to the line on schedule A where you’ll put the dollar amount! ALL NEW! Give your child the very best education whether you want to send them to private school or home school. TIP #184 is a godsend that shows you how to help cover the cost for materials, tutors, and more. Get Uncle Sam to help pay your energy bill. TIP #30 shows you how to get your hands on this money — and even how it can make you extra cash when you sell your home. Get tax-free money in retirement! TIP #125 shows you how to put away money for retirement you can take out without paying taxes — and you don’t have to take those pesky required minimum distributions. Another bonus: Any money left goes to your heirs tax-free! The medical deduction you’re probably missing. Buried deep in the tax code is this gem that lets you legally deduct the cost of medical travel! TIP #87 shows you how to deduct hotel stays for out-of-town care, miles driving to and from doctors, therapists, labs, and more. Give your grandkids money for college without paying a dime in gift taxes. If you follow TIP #163, it lets you give them as much as you want without paying gift taxes. This is one gift they’ll never forget. Do you prepare your own taxes? TIP #220 reveals the 9 adjustments you’re probably missing on your 1040 form. These hidden adjustments could help you save a bundle. Pay zero taxes on required minimum distributions (RMDs). When you reach the age of 70½ you must start taking distributions from your IRA. Since you didn’t pay taxes when you put the money in, you have to pay up when you take the money out — unless you know the special provision revealed in TIPs #132 and #133. Here is where you’ll see how to make a donation from your IRA directly to your favorite charity. You get two big benefits: The donation counts as your required distribution, and you don’t pay taxes on the amount you withdrew. These secrets alone could easily save you thousands, maybe tens of thousands, and I haven’t even scratched the surface of what’s inside this award-winning new book. Collect rent payments the IRS doesn’t count as income. TIP #43 lets you earn extra cash tax-free! Cosmetic surgery costs you can legally deduct. TIP #207 explains. Deduct medical costs for a dependent who isn’t a dependent. TIP #80. Get the IRS to waive penalties for mistakes you made on your taxes. Everyone needs to know TIP #190. Make a bundle of money helping the IRS. Check out TIP #226. 13 tax no-no’s that could trigger an audit. Chapter 12 is a lifesaver. The Trump Tax Cut brings you hundreds of ways to decrease your tax bill. You’ll see how to legally take deductions on almost everything, from medical expenses and charitable donations to care-giving costs to home and property deductions to investment and retirement savings, to your child’s (or even your grandchild’s) education — and so much more. You’ll get tips for keeping records and tools that help you maximize deductions, including the secrets to getting the best tax benefits… 7 signs you can (and should) do your own taxes… you’ll find ways to save on taxes in every area of your life. 3 big state-tax deductions most people miss — including tax pros! The amount you’re deducting can easily add up to thousands of dollars. Don’t miss TIP #9. Worried about having enough money for retirement? TIP #148 shows you how to boost the income in your Social Security account. Tip #53 makes almost everything in your home tax deductible! Imagine how HUGE your refund will be when you see how to deduct everything from groceries and homeowner’s insurance to big-screen TVs and a professional landscaper! Perfectly legal. NEW! Do you own a second home? You probably know you can deduct the mortgage interest on your main residence. But did you know you could also deduct it on another property you own? You can even pick the two homes with the highest interest deductions. TIP #12 has the details. Why whole life insurance may be a much better way to save for college — or nearly anything at all. TIP #168 is simply brilliant. Do you volunteer? Here’s a giant tax break you deserve! Whether you’re shuttling people to doctors’ appointments or delivering Meals on Wheels, TIP #62 shows you how to get money back for your mileage! As long as we’re talking about helping others, you’ll want to be sure and check out TIP #91. It reveals tax traps that can come from donating on sites such as GoFundMe. Don’t worry, we will show you how to help those in need without accidentally generating a huge tax bill for them. Believe it or not, you’re in control of how much you pay Uncle Sam, your state, the city you live in, even how much you pay in sales taxes and more. Why pay a penny more in taxes than you need to? The ALL-NEW change that will instantly help 70 percent of Americans! Chapter 1 explains how easy it is to cash in. Get a 100 percent write-off buying a new business car your first year! See Tip #61. Get the government to help pay your energy bill. Tip #30 is HUGE! The most overlooked tax deduction many accountants don’t even know. Tip #5. How you can still deduct the mortgage interest on TWO homes! Tip #12 reveals the details. ALL NEW! Take $10,000 of distributions from 529s to help cover the cost of home schooling. Tip #184 is a real godsend. Do you drive for Uber or use your car for work? Tip #78 steers you to the biggest deduction. Get more money back for each qualifying child you have under 17. Chapter 1 shows you how. A better way to save for college. Tip #168 could help millions. 13 tax no-no’s that could trigger an audit. The full list and explanations are yours in Chapter 12. ALL NEW! Deduct more for medical expenses! The threshold for medical expenses plummets by 25 percent! Collect rent payments the IRS doesn’t count as income. Tip #43. Why you should never, ever donate your car no matter how worthwhile the organization. Tip #111. 3 deductions that usually slip right past the IRS. This is Tip #1 for a reason! And hundreds more tax deductions, tips, and loopholes! The Trump Tax Cut will help you maximize your deductions for 2018 & 2019! There is absolutely no question you need The Trump Tax Cut guidebook BEFORE you file your 2018 taxes in 2019. This is really the best guide to the new tax law. You must get it. It’s just $20 — the cost of a fast food meal for two. But it could save you thousands, if not tens of thousands of dollars. It’s at bookstores everywhere or check out the FREE Offer and save $20 immediately with bonuses worth up to $80! Note: This offer was brought to you by Newsmax Finance.